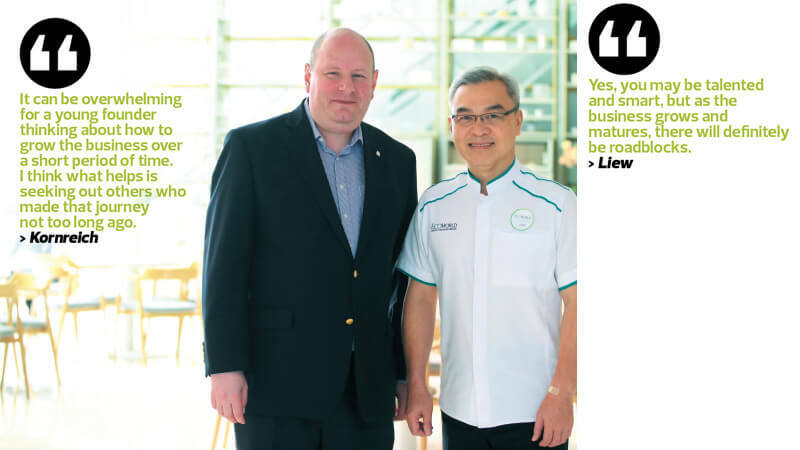 This article first appeared in Enterprise, The Edge Malaysia Weekly, on September 10, 2018 - September 16, 2018. Eco World Development Group Bhd chairman Tan Sri Liew Kee Sin, a veteran property developer and highly successful entrepreneur by any standard, says being a successful entrepreneur is about doing many small things well. “Normally, when you start your own business, you are a one-person show. You would not be so structured in terms of how the business is run. And if you are young, the banks won’t give you money because you still do not know how to present yourself and the business does not yet have any cash flow management plans or governance systems in place,” he adds. Liew feels that a little preparation goes a long way. Aspiring entrepreneurs, he says, should go into business knowing how to manage and monitor foundational elements of the business. Basic functions like proper bookkeeping habits, well-oiled accounting treatments, honouring contracts and mandating strong documentation procedures will help “institutionalise” the start-up for the years to come. Having good internal business practices is one thing, but there are other more intangible skills that young founders need to hone. One of the simplest, but also the most overlooked, is humbling oneself to ask for help. Alliance Bank Malaysia Bhd group CEO Joel Kornreich echoes the sentiment. The veteran banker advises young entrepreneurs to constantly be on the lookout for mentors. “It can be overwhelming for a young founder thinking about how to grow the business over a short period of time. I think what helps is seeking out others who made that journey not too long ago. These more experienced hands will be able to guide young entrepreneurs through many common transition periods,” he says. Young companies scaling at speed is an exciting thing, but it is a double-edged sword that can cause more harm than good if the founders are not careful. “Speed is very important because regardless of whether you are a start-up or an established player, your ideas can be copied almost overnight. The speed of growth must always be complemented by innovation. Whatever you do today, the world will know about it almost instantaneously, so you must consider how to keep innovating to stay ahead,” says Liew. But there is a more subtle science to the start-up game. A popular myth is that extroverts make the best, or at least the most charismatic, entrepreneurs. Liew hastens to debunk this notion. “Some of us are naturally gifted speakers and enjoy playing the role of marketer, but others are perhaps more reserved. Entrepreneurs are a diverse bunch and so, by getting together to network from time to time, I find that founders are able to learn from one another. Yes, networking is a great way to make new business contacts, but one should not underestimate the benefits of learning by observing,” he says. Kornreich points to two alumni of the now highly popular Alliance Bank BizSmart Academy SME Innovation Challenge. “Christy Ng of Christy Ng Shoes and Sherlyn Tan of fashion design start-up Twenty3 are two past winners of the challenge and, quite frankly, they could not be more different. Ng is an off-the-charts extrovert whereas Tan is an off-the-charts introvert,” he says. Having been a highlight of Malaysia’s start-up calendar since 2013, the competition has now been christened the Alliance Bank-EcoWorld BizSmart Challenge 2018. This year marks the maiden collaboration between Alliance Bank and property giant EcoWorld. This year has also been a particularly satisfying milestone for the competition as it takes on a reality television show format. It is the first reality TV business programme in the country by a financial institution. “As SMEs are at the core of what Alliance Bank does, we sought a creative way to help them maximise their chances of business success. But we also wanted to equip them with a host of technical and soft skills. In this regard, the programme is more than just a challenge — it is our way of coaching people to help them become more successful,” says Kornreich. This is EcoWorld’s first official foray into the challenge, but Liew’s personal connection to the challenge stretches well back. The heavy emphasis on entrepreneurism appealed to him and he has been an avid supporter of the event since its inception. A long time chief judge of the challenge, Liew decided to up the ante this year by bringing EcoWorld’s substantial experience and resources to bear. In fact, he even contributed a portion of his own money towards the RM1 million grand prize. For him, it is all about paying it forward. “I think entrepreneurship is the key to any economy. I was very lucky in my early years to have received a lot of assistance, not just from friends who showed me which doors to open, but also bankers who were on hand to advise and assist me,” says Liew. Having had his mettle tested in the past, he understands the value of having a support system. Entrepreneurship is often a lonely journey, so he believes in getting entrepreneurs to support each other. That is why he deployed the impressive resources and expertise of his EcoWorld Incubator to the BizSmart Challenge. Kornreich is excited to be able to partner EcoWorld in an official capacity. “I think it is a fantastic fit, this collaboration. We [Alliance Bank] believe in providing innovative solutions that are fast, simple, responsive and aligned to our clients’ needs. I think these are the kinds of values that EcoWorld practices. It builds products that are innovative, sustainable and aligned with its customers’ needs. Also, I think the energy that Liew brings to this endeavour is extraordinary,” he says. Over the years, Kornreich and Liew have come to realise that the relationships they build with these talented start-ups extend well beyond the challenge. Both of them have gone to great lengths to stay in contact with the alumni, regardless of how they did in the competition. “The previous participants were almost unanimous in informing me that the networking opportunities they gained as a result of being in the challenge were invaluable. They now help each other by providing contacts and making references, or even getting supplies from one another,” says Liew. The fifth iteration of the BizSmart Challenge will see 12 finalists compete on TV for a RM1 million purse, extensive media coverage and up to RM5 million in collateral-free financing. The Alliance Bank-EcoWorld BizSmart Challenge will premiere on AXN at 8.05pm on Oct 26 and be featured on Astro Awani the following day at 9pm. Alliance Bank Malaysia Bhd group CEO Joel Kornreich and his team of enterprise financiers noticed a distinct gap in the enterprise landscape. Many of the country’s small businesses are still involved in relatively labour-intensive industries. A natural consequence of this, of course, is a high representation of foreign workers in the workforce. According to Kornreich, the top priority for foreign workers is to have the ability to remit money back to their home countries. This creates a few problems for employers, not least of which is the need to have large amounts of cash on hand. Foreign workers also need to take the time to have the money converted into their own currencies. Only then can the funds be remitted back home. “This is not great for the businesses or workers. It is risky for businesses to hold large amounts of cash and it is obviously not safe for foreign workers to handle their entire pay packets in cash. There is a lot of risk and unnecessary administrative work, resulting in a loss of productivity for the business. To us, this scenario demonstrates a clear lack of empowerment on the part of the foreign workers,” says Kornreich. The solution, according to Alliance Bank, was to create the Alliance Cash2Home mobile app. The bank creates accounts for cash deposits and withdrawals, which are then linked to the Cash2Home app. It performs many of the ubiquitous financial technology functions such as remittances and mobile prepaid reloads, all via the mobile phone. The bank is even able to organise on-site activation of ATM services for the foreign workers at the business premises. Automated payroll crediting also removes the need for businesses to handle cash for payroll processing. “The app is based on facial recognition and character recognition technology. Also, because many foreign workers do not speak English or Malay, the app comes with local language support,” says Kornreich. The system has proven to be so popular among small businesses and their foreign workforce that now, the bank is piloting a separate version of the service for local staff. “We are certainly a market leader in terms of the remittance application for foreign workers,” he says. Alliance Bank’s push in the small business segment is bearing fruit. “Our SME business comprises half our total non-individual financing business. Over the last three years, we have seen a compound annual growth rate of more than 18% and that places us pretty much at the top of the enterprise financing market,” says Kornreich, who intends to raise that to 20% in the near future.